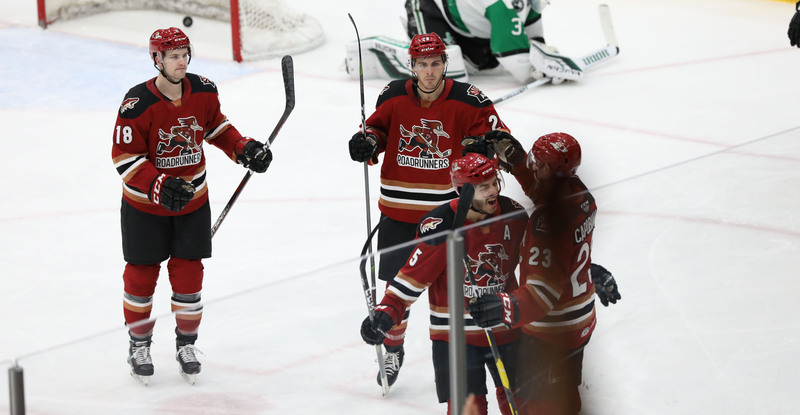 Matched up against the Texas Stars for the first time since the second round of the 2018 Calder Cup Playoffs, the Roadrunners came away with a 6-3 win on Monday evening at Tucson Arena. 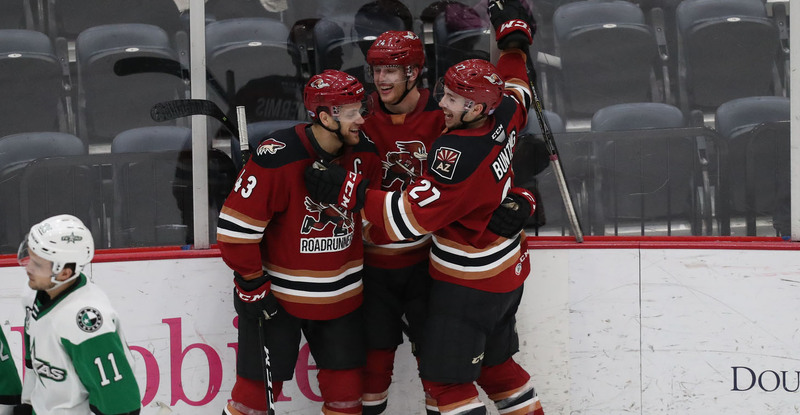 Facing one-goal deficits on three separate occasions, the Roadrunners responded each time before tacking on three unanswered tallies in the third period to secure their 22nd win of the season. Entering the second period down 1-0, Kyle Capobianco evened the score less than three minutes into the middle frame, capitalizing during a five-on-three power play when he beat Texas’ Landon Bow with a slap shot to the glove side. After the Stars reclaimed the lead, going up 2-1 on Denis Gurianov’s tally, Michael Bunting once again knotted things up on the scoreboard when his sharp-angle shot found the back of the net with 8:48 left in the second. Bunting’s goal was his fourth in the team’s last three games. Texas took the lead once again, this time by a 3-2 count via Michael Mersch, but their one-goal advantage was short-lived, Lane Pederson scoring the Roadrunners’ third goal of the evening with 3:22 left in the middle frame. Pederson’s goal was his 11th of the campaign, tying him with Adam Helewka for the team lead. Hudson Fasching gave the Roadrunners their first lead, 4-3, in the opening moments of the third period when he fled in alone on a breakaway, burying a shot that ricochet off of the cross-bar and into the net. For Fasching, it was his 10th goal of the season. He became the fourth player on the roster to hit double-digits in goals scored. With under 10 minutes left in regulation, Capobianco scored his second goal of the evening when he deposited a wrist shot from the slot after joining a rush, upping Tucson’s lead to a 5-3 count. For Capobianco, it was his first-career multi-goal game. David Ullstrom added an empty net goal with 2:03 left to play, giving the Roadrunners a 6-3 lead, the night’s eventual final score. Six players finished the night with multiple points: Lane Pederson (1G, 1A), Kyle Capobianco (2G), Adam Helewka (2A), Nick Merkley (3A), Hudson Fasching (1G, 2A), and Michael Bunting (1G, 2A). Goaltender Hunter Miska stopped 21 of the 24 shots he faced to earn his ninth win of the year. The Roadrunners will see the Texas Stars again on Wednesday night at Tucson Arena, where the puck is scheduled to drop just after 7:05 PM.